We'll visit the remote barrier island of LaCosta (Cayo Costa State Park) where you can get off the boat and step onto the unspoiled pristine beaches of this 7 mile island. On the beach you can explore the local landscape finding Sand Dollars, Sea Shells and other interesting island life forms or, you might just decide to take a swim and lay on the beach while listening to peaceful rythym of the surf. 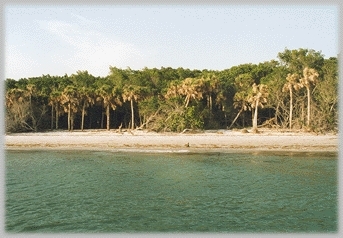 After leaving LaCosta island we'll cruise over to another out island called Cabbage Key. Cabbage Key, unlike LaCosta, is not a 'barrier island' but a 'leeward island' like our Pine Island. All along the way you will see birds diving, and most of the time we'll see our local bottlenose dolphins swimming freely as they're meant to be. Can you think of a better way to spend '3 hours' on Pine Island? Give us acall at 239-283-0015 and let us show you a natural time.